Locating eBooks in the UW Libraries collection involves two steps: searching for material using relevant words and phrases, and refining the search results to display only eBook titles. 1. 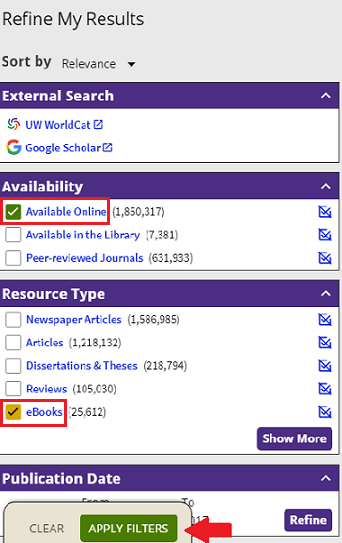 Type your title or topic into UW Libraries Search. 3. Click on Resource type: eBooks. 4. Click on Apply Filters. Tip: If you don't see the Resource Type you need, you may need to click Show More. 5. Select an eBook title and click on the title for the item. You can then click on the link available in the View It section to access the eBook.